Mammalian development occurs in utero, which makes it difficult to study the diverse morphogenetic events of neural crest cell development in vivo. 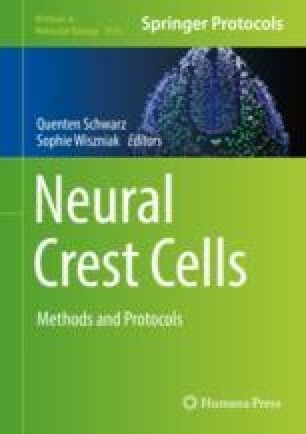 Analyses of fixed samples in conjunction with histological methods to evaluate the spatiotemporal roles of specific genes of interest only provide snapshots of mammalian neural crest cell development. This chapter describes methods for isolating and culturing mouse embryos and their organs in vitro, outside the mother, to facilitate real-time imaging and functional analyses of the dynamics of neural crest cell development. Work in the Trainor laboratory is supported by the Stowers Institute for Medical Research and the National Institute of Dental and Craniofacial Research (DE016082). WAM is supported by the American Association of Anatomists Postdoctoral Fellowship.